Out of respect we didn’t go around snapping pictures of The Killing Fields, although I did take one of S21. It’s hard to find the right words to sum up how I felt about going to The Killing Fields; excitement certainly isn’t the right word to describe it but it was somewhere I definitely knew I wanted to visit on my trip. The day was absolutely harrowing and I came away feeling broken. For those of you that don’t know, The Killing Fields (Choeung ek) is one of around 3000 mass graves created during Pol Pot’s Khmer Rouge era. During 1975-1979 the Khmer Rouge killed over 3 million people – 1/4 of all citizens, in their desire to bring Cambodia to a communist feudal state. Anyone who was seen as a threat, due to education, city residence or resistance to the regime was sent to a ‘re-education camp’ and ultimately killed. Further to this, families of those being killed were also subject to the same treatment as it was believed that ‘in order to remove the grass you must remove its whole root’. For me this was probably the most devastating part of the visit – preserved within the killing fields is a tree the soldiers used to smash baby’s heads against before throwing them in to pits. It’s hard to believe that these barbaric acts were happening just ten years before I was born, that my parents, being university age in 1979 would have been educated people sent for ‘re-education’. The graves are still so recent that every two months freshly emerged bones have to be picked up from the pathways and pits. There’s also a commemorative stupa located in the grounds, consisting of 100’s of skulls excavated from the mass graves, here they are labeled according to method of death. In order not to waste bullets the victims were beaten to death with farming equipment, the final sounds they heard being propaganda songs blaring over a loudspeaker to drown out the sounds of their murders. After the killing fields we visited S-21 prison, a highschool converted into one of the most notorious prisons under the regime. Here we witnessed the tiny roughly 5x2ft cells prisoners would have spent months being tortured in and saw photographs of just a selection of the people who passed through the doors of the prison. 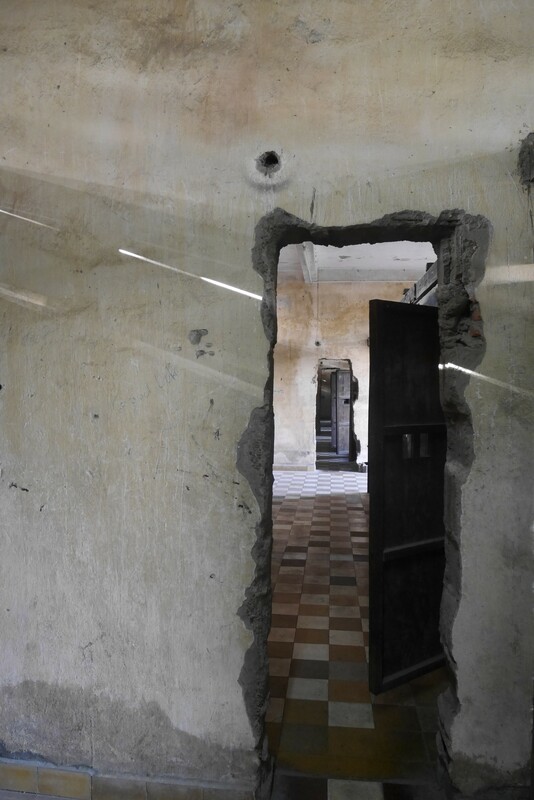 Still to this day people suffer from the after effects of the Pol Pot regime – the countryside is littered with mines placed by the Khmer Rouge that continue to detonate and cause life changing injuries. It’s absolutely outstanding that in just 30 years Cambodia has turned itself around from such devastation. Not only have they managed to preserve the historical and cultural identity Pol Pot attempted to obliterate but the level of English speaking found throughout the country suggests that education is fairly good in the country too. Unfortunately, neither Steph nor I particularly liked Phnom Penh, although it seems imperative to come to for the Killing Fields alone. For starters the city doesn’t have the same safe, friendly feel that the rest of Cambodia exudes and we know that bag snatchers on motorbikes are a problem in the city. Secondly, we’ve found that again, unlike the rest of Cambodia, people have been trying to rip us off at every available opportunity. We had two tuktuk drivers charge us $6 to go 1 minute round the corner and whilst I appreciate they’re only trying to make a living, ripping off tourists who are willing spending money in your country is not the way forward! On the plus side, we did find a supermarket to purchase $30 of cheese which we ate all in one night on a sarong bed tablecloth. The idea was to melt the camembert in my crotch by this was apparently the first time in 2 months my crotch hasn’t been a furnace. Yes I just said that. Sorry if you’re currently eating cheese. We also went to a massage place staffed entirely by blind masseurs. Not only does this give these disabled people an income, it was, probably not surprisingly, the best massage I’ve had in SE Asia. Previous Post Overcoming the hurdle – Mental health and travelling. Next Post My favourite place travelling in a wheelchair – Sapa.